I dye a lot of yarn with food coloring. This technique is color fast, but until I started working on this post I had never actually tested this. Well, I have hand washed items that I dyed with food coloring, but I never put a swatch in the washing machine. Shouldn't I demonstrate that washing a swatch of hand dyed yarn is just as vibrant after washing as it was before washing? 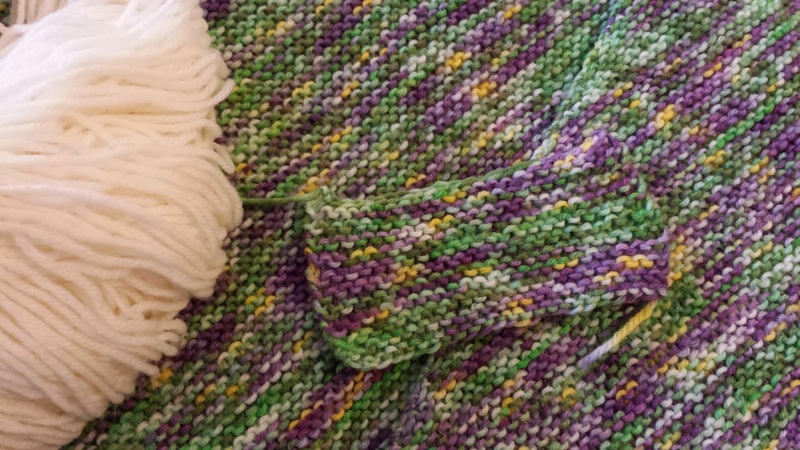 To accomplish this task I needed to use hand dyed yarn that is also machine washable. I dye a lot of 100% wool, and I didn't want anything to felt. I think part of the point here is to show that you can toss your hand dyed articles in with the rest of your laundry and they can turn out okay. 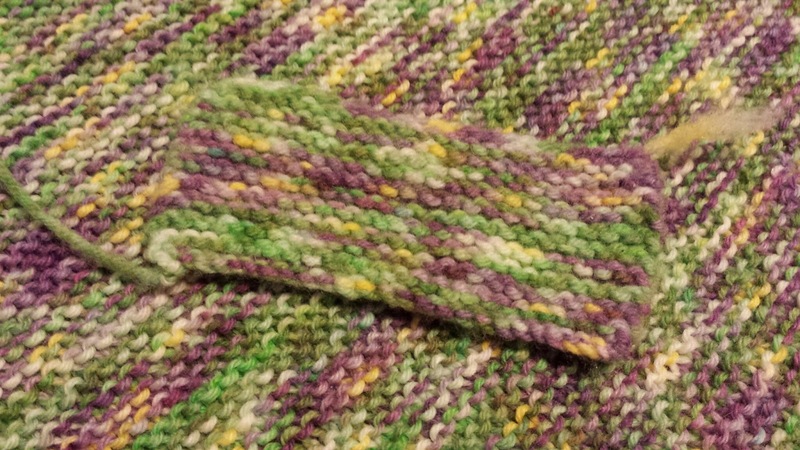 I cast on 25 stitches and knit up a little garter stitch scarf on size 4 knitting needles, the same size needles that I used to create the garter stitch hitchhiker scarf. As you can see in the above photo, I have the bare yarn to compare to the completed knit scarf and my swatch. I washed the swatch in the washing machine on the warm setting with some old towels. I selected the warm setting on my washing machine, but the washing machines in my complex don't REALLY have warm water, so I think technically it was washed on cold. (This is why I say cold in the video, I didn't want to explain our less than optimal washing equipment!) I then dried the swatch in the dryer. Wahoo! The only real difference after the washing is that the yarn fluffed up a bit. All of the color stayed in the yarn and my towels didn't get stained. I would still recommend washing hand dyed projects with items you don't care about first to make sure the color doesn't bleed, but this goes for commercially dyed yarns too. Don't forge to watch the video of me doing laundry. I promise it is more exciting than it sounds. 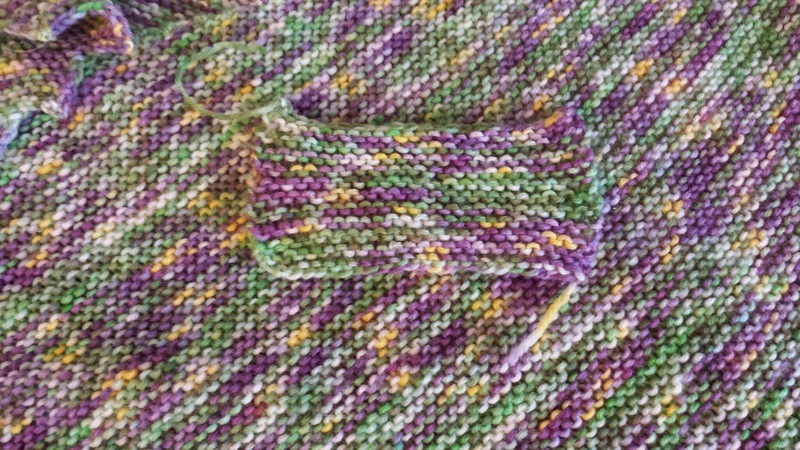 As for putting something that I knit through the washing machine (other than this swatch), that will have to come at a later date.